On the 20th May we held our ever popular Open Day. 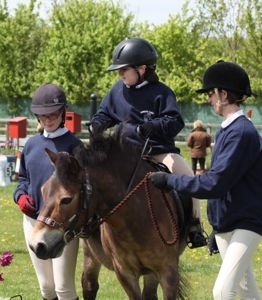 This is a great opportunity for riders to show off their skills and this year they did that by completing Grade Tests and taking part in the musical rides. Charlotte who has total vision impairment demonstrated how she does the Countryside Challenge with the aid of her tapping team. The day is also an opportunity for our ponies to show off their skills. The four smallest ponies Tango, Tawny, Boycie and Starra did a musical drive where they showed off a variety of school movement whilst being long reined. The bigger horses performed rides with the staff members, Louie with Sally and Owly with Clare took part in two rides. Rafferty was ridden by Lainey and JayBee by Livvy in the afternoon ride. Unfortunately this ride was outside during the only rain shower of the day so a big thanks to all who came out to watch it. There was lots of cake, barbecue and refreshments sold. Our spring raffle was also drawn and we need to say a big thank you to Anita for organising this. You can see some of what went on in the video below.